Like many Australians, I watched today’s carefully staged media drama unfold. From the unprecedented “welcome to country” that marked the commencement of Parliament on Tuesday, to Kevin Rudd’s delivery of the “historic” apology, and his subsequent interaction with a number of invited guests – the whole ordeal reeked of kitsch, empty ceremony and pretence. Quite frankly, I thought it was an overblown PR exercise for the new Federal Government, and that it verged on pandering to latent racist feeling in this nation. And so, while there are many leaders, elders, politicians, academics, journalists and clergy who have welcomed the events of today with fanfare and enthusiasm, I’m afraid I can’t join their number. Because, in the immortal words of The Princess Bride, I don’t think this apology means what they think it means. Let me be clear. 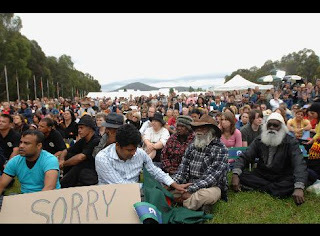 There is no denying the inherent rightness of apologising to those generations of Aboriginal families whose lives have been destroyed by the ignorance and bigotry of white Australia. There is no question that this apology will be received as a long-overdue official show of respect after the prolonged and disgraceful humiliation of “a proud people and a proud culture” (to use Rudd’s own language). And there is no alternative but to hope and pray that this “sorry” acts as a catalyst for the grieving and healing process – the beginning of the cathartic “sorry business” for which indigenous Australians have waited for so long. Nevertheless, this apology (like so much of the moral tokenism we perform today, superficial acts of charity designed to make us feel better about ourselves) seems to me to have been internally corrupted by wanton self-interest and political expedience. In this instance, it is particularly important to remember Immanuel Kant’s assertion that the moral worth of an act lies not in its commission but in its intention. For me, this leads to an inescapable conclusion. The reason that Kevin Rudd had to reiterate that this apology “does not attribute guilt to the current generation of Australian people” is not because we don’t believe we are complicit in the misery of indigenous Australians, but because we know that we are and don’t want to have to admit as much. As a nation, we have a pathological aversion to guilt precisely because of the objective guilt we all share. 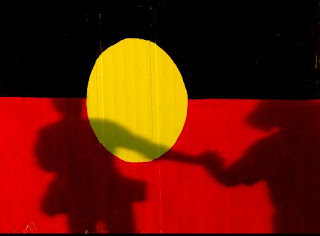 In his recent essay in The Australian, Noel Pearson made the stunning claim that “Aboriginal people’s lives were stolen by history.” It wasn’t simply that children were taken from their families, but the very capacity of Aboriginal people to “to pursue any form of sustainable and decent life” was taken from them “in the wake of European occupation and indigenous dispossession.” It is as if indigenous Australians are systemically excluded from the very cultural and economic way of life that was brought to this land with the occupation. Pearson here points to a kind of objective guilt that goes far deeper than the bare acknowledgment of past injustices, however brutal. It is a guilt that we can neither admit nor address without acknowledging the unjustifiability of our very existence as a nation, as well as the inherent inequity of the global economy in which we participate and through which we prosper. It is not simply that crimes have been committed by our forebears; it is we ourselves, in our very Antipodean and capitalist existence, that are wrong. Dietrich Bonhoeffer once said, “Success alone justifies injustice done. Guilt is scarred over, or cicatrized, by success.” Our prosperity as a nation, aided and abetted by tokenistic acts of penance – such as Rudd’s apology – have enabled us to repress and ultimately deny our guilt as white Australians. But there can be no turning of the page, no meaningful advance toward genuine reconciliation, without a willingness to tell the truth about ourselves, to lay bare and accept our guilt. This sort of national repentance would demand language far closer to Paul Keating’s Redfern address, with its overtly collective language and devastating litany of white crimes (“we took the traditional lands and smashed the traditional way of life … we committed the murders … we practised discrimination and exclusion … it was our ignorance and our prejudice”), rather than Rudd’s languid prose. And because our culpability is not simply past, but is now being repeated in the exclusionary logic of the Australian economy, such national repentance would have to include the provision of tax-payer funded compensation to indigenous Australians. Kevin Rudd knew that if either of these measures – accepting our guilt and providing compensation – were adopted in the apology, the groundswell of popular support would evaporate. Perhaps this is the final proof that the apology was little more than a spectacle for white Australians and a vanity exercise for a fledgling Prime Minister who needs people to love him.